In a comment to my post about the Ginghamburg Church’s website, Susan T. asked, “How about sharing some Unitarian websites that rock?” Good question! And thanks to my colleague Lisa Presley, Heartland District executive, I found one. Here it is, folks—a Unitarian Universalist congregational website that rocks so hard it’s positively seismic: the Unitarian Universalist Church of Indianapolis. Welcome: We are the church of the warm heart, open mind, and helping hands; where a growing, enthusiastic congregation shares ideas, dreams, and visions; where inclusiveness and diversity are sought and celebrated; where people are urged to get involved. Our Covenant: Love is the spirit of this church, and service is its law. To dwell together in peace, to seek the truth in love, and to help one another—this is our covenant. Our Congregation: Members of our congregation come from various religious, economic, social, and ethnic backgrounds. Our diversity creates a rich community where the inherent worth and dignity of every person is recognized. Spiritual Growth: We are committed to providing a welcoming and open environment where people can feel free to share their ideas and experiences and inspire others to grow in their own spiritual journeys. Strengthening Families: Our congregation welcomes and supports families of all kinds. We strive to provide an environment where family members can grow as individuals and as a family. Our rites of passage ceremonies allow our congregation to recognize and celebrate family milestones. Making a Difference: Social justice, helping those in need, and service to our community are at the core of our faith. We strive to be a vital part of our community, working to make our world a more peaceful and equitable place. Learning for Life: We are committed to life-long learning—learning about the world, ourselves, each other, and our religious heritage. Our religious education program provides classes, workshops, and activities for all stages of life. Above all, we support each other in the search for personal truth. Sure there are some things that I don’t see (videos, podcasts…they may be here, just not upfront), but that’s a minor complaint. This website is designed to bring people into the congregation for some face-to-face interactions. So there you go, Susan T. A UU congregational website that truly rocks the interwebs. Lifelong Faith Formation Network of programs, activities, and resources that incorporate a variety of ways to learn in a blended approach to faith formation integrating physical face-to-face settings and virtual online settings and utilizing a wide variety of faith formation resources and programs, people and communities. In addition to the essential things church websites should do (give information on Sunday services, have a visitors’ page, offer some explanation of the congregation’s faith tradition, provide directions and contact information), these websites have been designed to give everyone—current members as well as visitors—the opportunity to engage in some serious faith formation activities. The power of this “24x7x365” presence should be obvious. People are searching the internet at all hours of the day, looking for everything from President’s Day sales to the latest word on Justin Bieber, and some of those people might just be in your community, “trying to find the answers to life’s persistent questions.” And that’s where an online entree to a congregation’s Lifelong Faith Formation Network comes in. A Lifelong Faith Formation Network addresses the diverse life tasks and situations, spiritual and religious needs, and interests of all ages and generations in the four scenarios by offering a variety of content, programs, activities, and resources. A Lifelong Faith Formation Network guides individuals and families in discerning their spiritual and religious needs and creating personal learning pathways—a seasonal or annual plan for faith growth and learning. A Lifelong Faith Formation Network incorporates informal learning as well as formal learning in faith formation. A Lifelong Faith Formation Network utilizes a variety of faith formation models to address the diverse life tasks and situations, spiritual and religious needs, and interests of people: learning on your own, in small groups, in large groups, in the congregation, and the community and world. A Lifelong Faith Formation Network blends face-to-face, interactive faith formation programs and activities with virtual, online faith formation programs, activities, and resources. 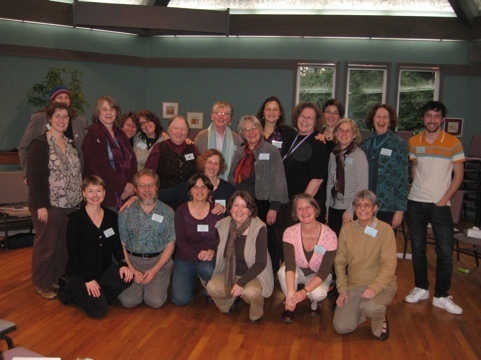 A Lifelong Faith Formation Network incorporates communities of practice to connect individuals and groups throughout the congregation. So, how’s your congregation’s Lifelong Faith Development Network coming along? I’ve been reading Ed Bastain’s book on InterSpiritual Meditation as part of a e-course I’m taking through SpiritualityandPractice.com, and I ran across this simple and beautiful Family Prayer. I could see it being used at dinner or as part of a bedtime ritual. For all these blessings, we give thanks. Ed says that the source is unknown, which seems fitting for the beautiful sentiments this prayer expresses. Gratitude for time well spent among colleagues! Today I’m presenting the Seven Tools for Building a UU Home to the Pacific Northwest Chapter of the Liberal Religious Educators Association. Quite a mouthful, I know. But that’s okay…I’ve got more than enough to say to them (or anyone who’ll listen) about Family and Multigenerational Ministry. Here’s a quick summary of the presentation. First, Family Ministry and Multigenerational Ministry are two sides of the same coin. One side (Family Ministry) is all about how families practice their faith, in their home and in their congregation. It’s the congregation’s job to provide resources for individual families so they can practice their faith in a way that gives their life together a meaningful existence. The specific resources a congregation offers to families to help them practice their faith as families, both in the congregation and in the home, constitutes Family Ministry. So things like family worship, family fun nights, and having families light the chalice at worship are example of Family Ministry within the congregation. The Seven Tools for Building a UU Home are, for the most part, examples of Family Ministry within the home. Multigenerational Ministry is more about the context in which Family Ministry takes place. It’s all about how welcoming a congregation is to the different ages and generations of which it is comprised. It’s about offering opportunities for different ages and generations to experience the fullness of their faith within their religious community. Sometimes I like to think of Multigenerational Ministry as the desire to embody the abstract concept of the Living Tradition in a sacramental way. The traditional definition of a sacrament is “an outward and visible sign of an inward and spiritual grace,” so gathering in a truly multigenerational community is the outward and visible sign of the inward and spiritual grace of our Living Tradition. The elders are our link to the past and the children are our link to our future. They are of equal importance because their presence in a multigenerational gathering ties us to all who have come before us as well as all who will come after us. We need to be attentive to both Family Ministry and Multigenerational Ministry in our congregations. These Seven Tools for Building at UU Home are primarily about Family Ministry. They are: Bedtime Rituals, Caring Conversations, Celebrating Holidays, Congregational Participation, Family Meals, Family Service, and Symbols of Faith. I would like to see congregations offer families guidance in how to use these tools in as many ways as possible, formally and informally: through sermons, religious education classes, small group ministry sessions, newsletter articles, and retreats. And to all of these traditional ways of doing faith development, I would add the internet as well. I would love to see every UU congregation in the country have a “Family Page” on their website. Ideally, this page would be part of a complete “Faith Development Network” that the congregation has created to offer faith development and spiritual opportunities to members, friends, and fellow travelers of all ages and generations (more on that later). A link to the page would have a prominent place on the congregation’s home page, and the content would continually be refreshed. A “Table Grace of the Week” would encourage families to engage in the practice of saying grace before their family meals, and a “Family Favorite Recipe of the Week” (ideally from actual families in the church) would help remove some of the obstacles families face when trying to share meals more often. Weekly “Conversations Starters” could be offered as well. You get the idea. So that’s the presentation in a nutshell. Okay, a rather large nutshell. If you have any examples of a congregational “Family Page,” I love to see them. Just post a link in the comments section.